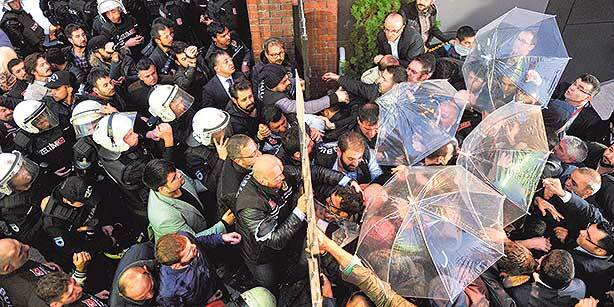 Today’s raids on Turkish media outlets are “yet another shocking attack on journalists and freedom of expression in Turkey, and come just four days before a crucial parliamentary election on Sunday,” according to Amnesty International in a statement released today. This afternoon, broadcasts by the Kanaltürk and Bugün news channels were cut after government administrators entered the building with policemen who forced their way in. Tarık Toros, editor-in-chief of the Kanaltürk channel, was removed from his duties and taken from the building in handcuffs by police. Earlier this week, prosecutors in Istanbul submitted an indictment to the court accusing 122 people, including Fethullah Gülen, of charges including “leading or founding an armed terrorist organisation”. This entry was posted in Academic Freedom, Andrew Gardner, Freedom of Expression, Freedom of Press and tagged AKP, Amnesty International, elections, Freedom of Expression, Freedom of Press, Gulen, Koza Ipek, Turkey. Bookmark the permalink.